Srinagar: A curfew imposed in Jammu since February 15, continued on Tuesday for the fifth consecutive day, police said. 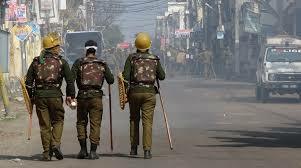 “The curfew imposed on February 15 will continue in Jammu today. A decision on its relaxation will be taken later in the day,” police sources said. On Monday, authorities had temporarily relaxed the curfew from 2pm to 5pm, in parts of Jammu’s south city areas. Since the curfew was imposed, there have been no untoward incidents. Meanwhile, authorities have of strict action against people who are uploading fake, inflammatory posts and pictures on social media. The curfew was imposed after mobsters, arsonists and rightwing extremists torched vehicles and damaged several others carrying number plates of the Kashmir Valley and attacked Kashmiri employees’ residences after the February 14 attack in Pulwama that killed 49 CRPF personnel.